Fiction – Kindle edition; Tinder Press; 338 pages; 2013. 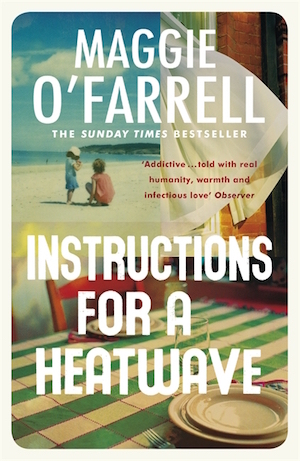 In 2013 Maggie O’Farrell’s Instructions for a Heatwave was THE book of the moment. It was all over Twitter, was a favourite with bloggers and became a Sunday Times bestseller. Four years on, I thought I’d give it a try. Unfortunately, I didn’t really get on with it. The story is a relatively simple one. It’s set in 1976, during the height of the infamous British heatwave of that year, and examines the outfall on one family when the patriarch, the last man rescued at Dunkirk during the Second World War, walks out of the family home never to be seen again. 1. It has a rich cast of characters — an Irish mammy, a trio of adult siblings and their various partners and children — all of whom are richly drawn and believable. Each character grapples with their own personal dilemmas: Aoife hides the fact she can’t read from everyone she knows, including her family; Monica is struggling to make friends with the step-children she never wanted and is still coming to terms with her own miscarriage many years earlier; Michael Francis is in love with someone else he cannot have but does not want his wife to leave him; and Gretta is devoutly Catholic but has committed a mortal sin that no one except her husband knows about. 2. The dialogue is spot on and O’Farrell is very good at capturing more than two people speaking at any one time (a tricky skill to pull off if you’ve ever tried to write fiction). 3. The depiction of sibling relationships is especially good, particularly the ways in which misunderstandings and perceived betrayals can lead to years of silence, heartache and estrangement. 1. The heatwave element was poorly done. Perhaps I’ve just read too much Australian fiction in which sizzling summer temperatures and drought becomes a character in its own right. But in Instructions for a Heatwave it felt tacked on and didn’t feel central to the story; from the mid-way point it could well have been set during a big freeze in the middle of winter and we’d be none the wiser. As a domestic drama, Instructions for a Heatwave is fairly conventional; it doesn’t do anything particularly original and if you’ve read dozens and dozens of novels by Irish writers (who excel at this kind of story) it feels fairly run-of-the-mill. But it’s readable and peopled with interesting, well drawn characters, and if you like your books to have neatly drawn endings, then it won’t disappoint. This is my 10th book for #20booksofsummer. I bought it in September 2013 and kept it hidden away on my Kindle all this time. I’m tempted to say something along the lines of “perhaps it should have stayed there”, but I won’t <insert winky face here>. It’s nice to know I’m not the only one who struggled with this. From comments I received on Instagram when I posted about this book, it seems that this one isn’t her strongest novel, so nice to hear that you liked This Must Be The Place much better. I will bear that in mind if I consider trying another novel by O’Farrell. Hi Kim – even after reading your review I have only the merest vague recollection of the book. However, This Must Be The Place was an excellent read for me and, like the above commenter, I’m an O’Farrell fan from her first novel. I think that’s why I didn’t really get into this story: there’s nothing really memorable about it. Yes, they’re interesting but NORMAL characters, and there’s not a specific scene or denouement that makes a particular impression. Hi Karen, as I mentioned to Kate above, there’s no particular stand out moments to make this a memorable story: the family, as a whole, is actually rather dull and uninteresting. I hope you won’t be put off O’Farrell. I dismissed her books for years as not for me but was persuaded to read After You’d Gone and loved it. Like Kate and Karen, I found this one unmemorable. It lacks the tension of her earlier novels. I read After You’d Gone when it came out pre-blog (a lifetime ago, now) and remember really loving it. But I just never bothered reading anything else by her for unexplained reasons. I now understand this one may not have been the best one to choose. Do you have a favourite? The Distance Between us is the one that pops into my head. I’ve not read This Must be the Place yet but I gather from friends that it’s also disappointing. She’s at her best with dual narratives. Have you read ‘The Vanishing Act of Esme Lennox’? I am a great fan of O’Farrell and in this novel I think she uses her ‘trademark’ flashbacks to great effect allowing a truly tragic story to be gradually revealed. No, I haven’t read that one. I hadn’t realised her flashbacks were trademarks; I think they’re tricky to get right and not sure she pulled it off with this one. Interesting to hear she does it well in The Vanishing Act… it’s the kind of story that would appeal to me. I listen to lots of audio books but tend to choose classics, Australian and genre. I’ve decided – this post has decided me – to list bloggers’ recommendations so I can make intelligent choices from the general fiction titles I normally skip over. Now all I have to remember is to carry the list with me to the library. Do you have a smartphone, Bill? That’s where all my lists are kept these days. I can always put my hand on a list whenever I visit a library or bookshop — it revolutionised my life! LOL. I liked this one more than you did, but it was also my first O’Farrell and I was impressed by all the things she did right (that you have already mentioned above). I haven’t read any others since, but have heard that most of them are even better, so I’m looking forward to them! I can’t believe I’ve never read any of her books – but I haven’t. Maybe this wouldn’t be the best place to start – I took my O-Levels in the heatwave that year and have such clear memories of the time, so if she doesn’t handle that aspect so well as you suggest, it’d bug me! This is only the second one I’ve read by her… and there was a gap of 17 years (!!) between the first one I read and the second one! I’m not convinced she’s the author for me… Also, if you have clear memories of the heatwave then I think you’ll be disappointed by this… she captures the atmosphere very well for about a quarter of the book, but then it’s barely mentioned. Cynical me wonders if it was just a good marketing hook to hang it on…?